If the forecast is correct, we are likely in for another snowy weekend. Don’t fret! Dress warm, get outside, and play around. We’ve identified three local parks near Redmond Town Center for arctic enjoyment. 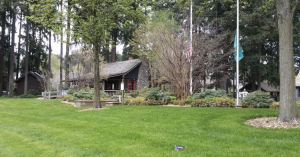 Redmond Central Connector – Otherwise Known as Snow Shoe Heaven! Put on your snowshoes and traverse four miles of Redmond’s Eastside Rail Corridor. This area is a part of a regional partnership that provides access for regional utilities and light rail. This corridor is the artery of the City that links Sammamish, Redmond, and Kirkland. It also knits together Redmond Town Center, historic Downtown, Grass Lawn neighborhood, and Willows business district. The Connector revitalizes 30 acres of prime real estate in Redmond. Located in downtown Redmond, Anderson Park is the first and oldest park in the city. 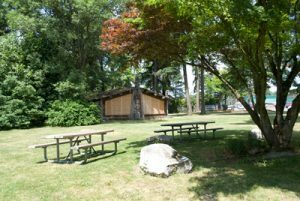 Enjoy the covered picnic shelter, picnic tables, and children’s play area. Anderson Park is a lovely oasis of green grass, flowers, and towering evergreen trees conveniently located in downtown Redmond. This lovely park whose namesake, Dudley Carter, is an internationally renowned local artist specializing in wood carving. With just over one acre of green space along the Sammamish River Trail, it’s a perfect venue for a lively snowball fight. 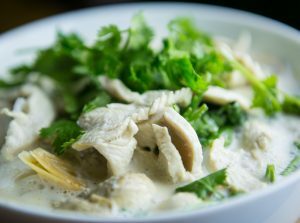 When you are finished playing in the snow, stop on by Thai Ginger for a hot bowl of delicious soup. Look what’s on the menu! 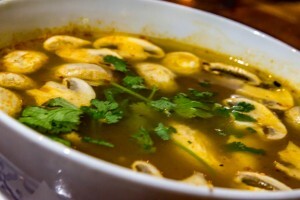 A traditional hot & sour Thai style clear soup simmered with mushrooms, lemongrass, chili paste, lime leaves and cilantro.Comes with your choice of chicken, tofu or vegetable. Upgrade with prawns or a seafood combination. Another traditional hot & sour soup simmered with coconut milk, galangar, mushroom, lemongrass, lime leaves and cilantro.Choose from vegan tofu, chicken, or vegetables. Upgrade with prawns or a seafood combination. 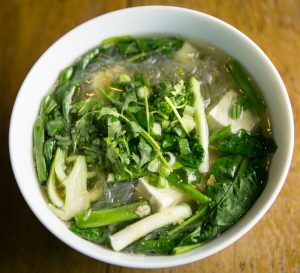 Steamed fresh wide rice noodles in clear broth with bean sprouts, green onions and cilantro. Vegan Option when ordered without fish sauce and with tofu. Choose from chicken, pork, tofu or vegetables. Upgrade with beef, prawns or a seafood combination. Steamed egg noodles in a clear broth with bean sprouts, green onions and cilantro. Choose from chicken, pork, tofu or vegetables. Upgrade with beef, prawns or a seafood combination. This option is available with soft tofu only. No additions. Not available on Take-Out orders. Dine in only. Be sure to check our website and/or Google for our current hours. Bad conditions may make it difficult for our staff. We will do our best to serve you all weekend long regardless of the snow!